October is a time for falling leaves, jack-o’-lanterns, and post-season baseball. I love October baseball because it’s time for the playoffs and the World Series. And I especially love October baseball when my Giants are playing. Yes, I said “my” Giants. No, I’m not a shareholder of the team, I’m certainly not on the pitching staff, nor do I live in San Francisco. Regardless, in October, they are my Giants. I’m a loyal fan of the Giants baseball franchise when two important criteria are present. First, they need to be winning, and second, the season needs to be almost over. 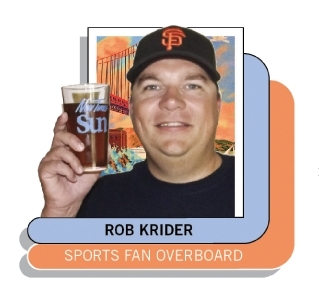 Sure, you could call me a “front-runner” or a “fair weather” fan and those would be very accurate adjectives to describe me. Because you generally won’t find me screaming at the television when the Giants are losing a game in April, the fourth game of a 162-game-long season. I don’t do 162 of anything, especially not three-hour-long baseball games. But in October, you can most definitely find me screaming at a television set. I scream for joy, I scream for agony, I just simply scream at the Giants. I love those guys. They need me to scream. It helps them win games (this claim has been proven based on empirical data taken from studies of the 2010 and 2012 baseball seasons where I screamed relentlessly at the TV and the Giants won two World Series Championships). You can’t argue with the facts here, folks. Now that it’s clear that I love the Giants (if they’re winning in October) and that I scream at the television (whether they’re winning or losing, but it does help them win), let’s set the mood for the following scenario: It’s October, during the Morro Bay Harborfest sponsored by the Sun and New Times, and there’s lots and lots of beer to be tasted. With my souvenir Sun/New Times glass, I did my due diligence and tasted lots and lots of beer. After a full day of beer tasting, the Giants were scheduled to play the Washington Nationals in a playoff game. I found a quaint little bar near the water with a big screen TV, ordered an 805 beer, and settled in for a nice nine-inning game of drinking and screaming at the television. All was right in the world. Except this was no nine-inning game. Unbeknownst to me and my alcohol intake, this was to be an 18-inning epic battle of October baseball proportions. One my voice and liver would suffer dearly for. First Inning: Tim Hudson is the starting pitcher for the Giants. Jordan Zimmerman pitches for the Nationals. Rob Krider orders a pitcher of 805 beer. Score: Giants 0, Nationals 0, Krider 1. Second Inning: It’s a pitchers’ duel, with neither team able to get a runner home. Krider has made friends with many people at the bar. Lots of Giants fans in Morro Bay. Awesome. Score: Giants 0, Nationals 0, Krider 2. Third Inning: The Nationals get a single run in and take the lead. Rob yells at the TV. It isn’t looking good. Rob decides to order more 805. Score: Giants 0, Nationals 1, Krider 3. Fourth Inning: Giants’ pitching holds the Nationals back. Unfortunately the Nationals do the same for the Giants. No score in the inning. Rob decides after three beers it’s time to hit the bathroom. Score: Giants 0, Nationals 1, Krider 3. Fifth Inning: Giants can’t get anything going and they remain behind by one point. Rob yells at the TV and then orders garlic fries. Score: Giants 0, Nationals 1, Krider 3. Six Inning: Both teams scoreless. Garlic fries make Rob thirsty. Another 805 is ordered. Score: Giants 0, Nationals 1, Krider 4. Seventh Inning: The Giants just can’t get a man home. They leave multiple players stranded on base. This causes Rob to really yell at the television and order more 805. Score: Giants 0, Nationals 1, Krider 5. Eighth Inning: Neither team can get a run. The game remains a one-point spread. The Giants are running out of chances. Rob is running out of garlic fries. Score: Giants 0, Nationals 1, Krider 5. Ninth Inning: Desperate times call for desperate measures. Rob orders more beer and then really starts to yell at the TV. It seems to be working. Pablo Sandoval is at the plate for the Giants, Joe Panik is on second base. Sandoval “The Panda” cranks a double, Panik runs in and scores! Rob jumps for joy, screams at the TV and spills 805 all over the bar. No one seems to mind. Score: Giants 1, Nationals 1, Krider 6. Tenth Inning: Overtime. Somehow the Giants stay alive (probably from all of Rob’s yelling, again proving the yelling does work) and the Giants have a chance to win the game. They don’t, and it brings them to another inning. Rob makes another run to the bathroom. Things are getting a little blurry. Score: Giants 1, Nationals 1, Krider 6. Eleventh Inning, Twelfth Inning, Thirteenth Inning, Fourteenth Inning, Fifteenth Inning, Sixteenth Inning, and Seventeenth Inning: Not a darn thing happens in the game. The relief pitchers are on fire. The batters are useless. The only thing that has happened is Rob continues to drink and yell. He’s losing his voice. Other bar patrons are starting to tire of his shenanigans. Even the bartender begins to give Rob dirty looks. Rob continues to yell. The Giants need him to yell. Score: Giants 1, Nationals 1, Krider (unknown at this point). Eighteenth Inning: Rob screams, Brandon Belt swings and crushes a home run, which clinches the game for the Giants! Eighteen innings, 6 hours, 23 minutes of play time and a bar tab for Rob of $136.50 (garlic fries included). Score: Giants 2, Nationals 1, Krider (broke with no voice and no friends left at the bar). The Giants may have won the game, but Rob lost the battle and paid dearly the following day for his drinking sins. If you enjoy Rob’s stories check out his first novel, Cadet Blues, available on Amazon.com.